For all things devoted to babies, visit Babies R Us, online at BabiesRUs.com. Babies R Us has a comprehensive collection of baby items, like strollers, diapers, bottles, toys, furniture, clothes, and more. Create or find a baby registry with Babies R Us. Discover top baby brands like Chicco, Carter’s, Medela, and Gerber. Babies R Us gives you great savings and selection, which are important when it comes to taking care of your baby. Be sure to check RetailSteal.com before you shop so you can save even more with Babies R Us discounts, Babies R Us coupons, and Babies R Us promotions. Free shipping on all purchase of $100 or more (excludes certain items). Get your products delivered in as little as 2 business days. 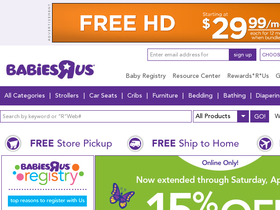 Babies R Us accepts returns on purchases made within 90 days. Check website for full details -- exclusions may apply. Shop the clearance section at Babies R Us and save up to 65% off clothing for babies and toddlers. Click link to shop. Use this code on Babies R Us to save 15% on Boppy Pillows. Shop at SleepyHeads and enjoy 25% savings on footed pajamas. Click here for code.